When you drive south from Ponteland you either go A1 or M6, or – if you have plenty of time – you go down the Pennine chain. Beautiful B roads to Middleton-in-Teesdale. It is a lovely village and we found a nice cafe – Cafe 1618 – with very good bacon sandwich and lemon meringue pie. 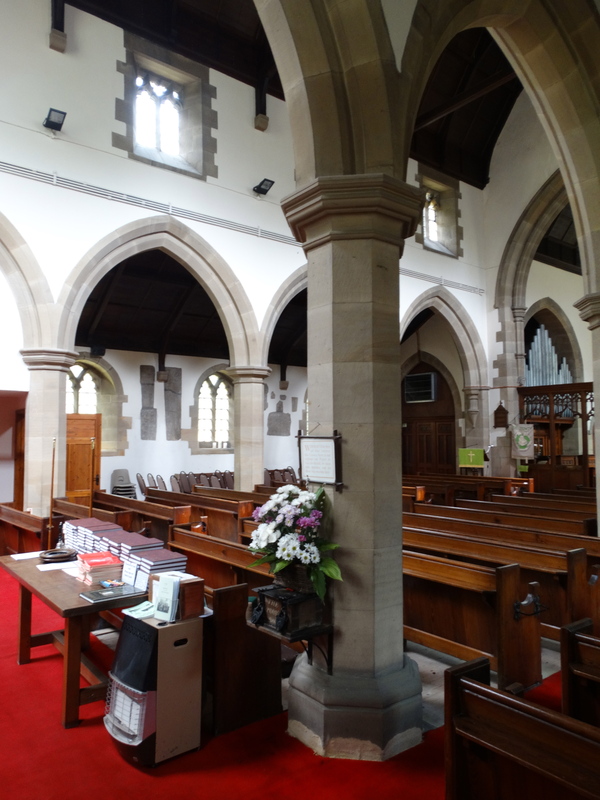 I walked round the corner – the Methodist church has a noticeboard listing all the churches’ services. The church website – website – is an ecumenical website (though “What’s On” is only advertising their Holy Week services). St Mary’s was locked and the Tourist Office had mislaid their church key, but the Village Bookshop – www.villagebookshop.co.uk/ – owned by a charitable trust, run by volunteers, lent me a key and looked after Julie (this was an expensive church visit!). 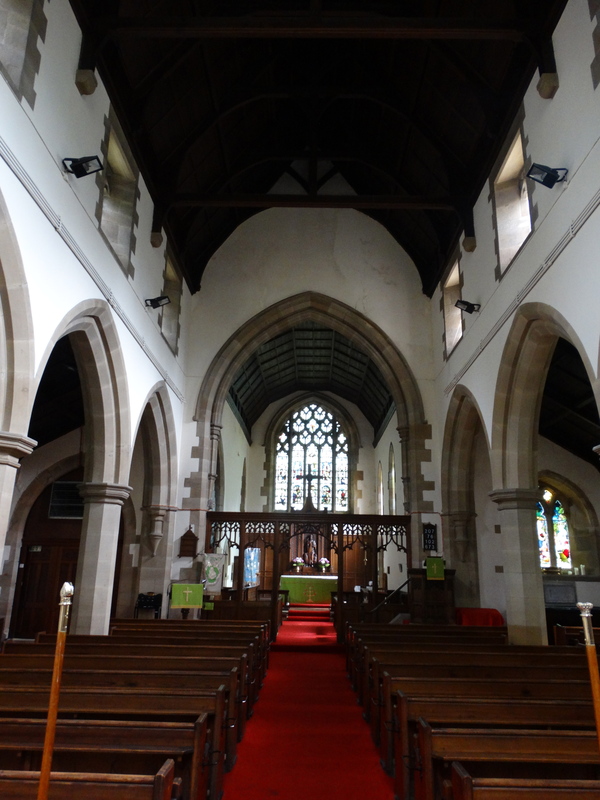 A church dedicated to St Mary the Virgin has been on this site since 1170, part of St Mary’s monastery in York. 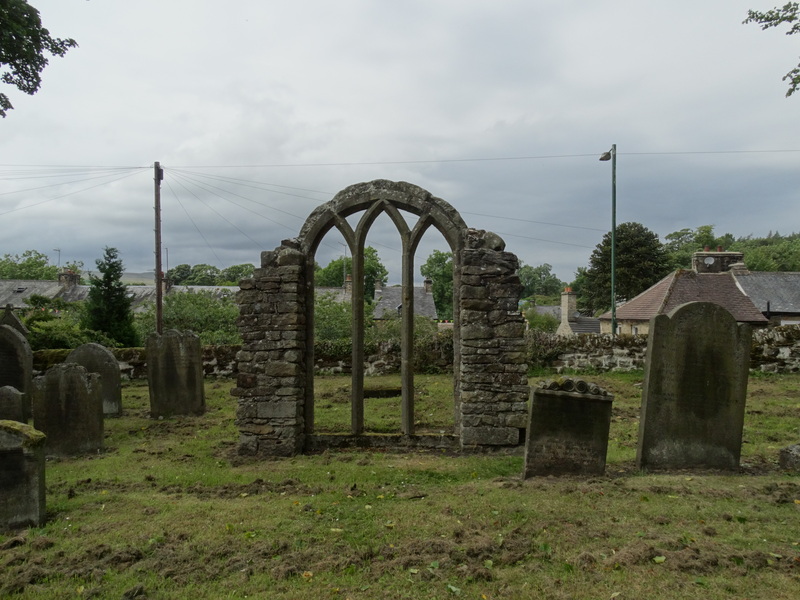 The C13 church was demolished in 1876, and the east window is planted in the churchyard. 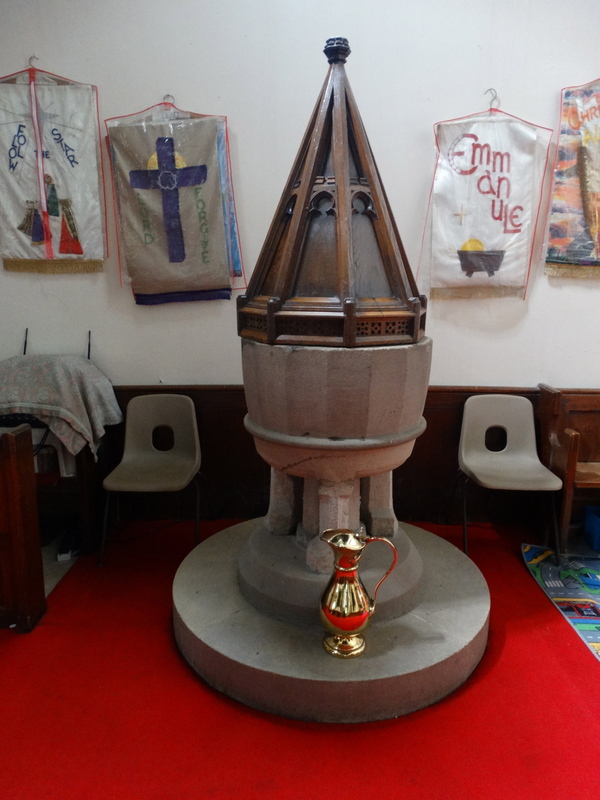 The pedestal of the font and a piscina from this church are in the new church – I unlocked the gate and the door. 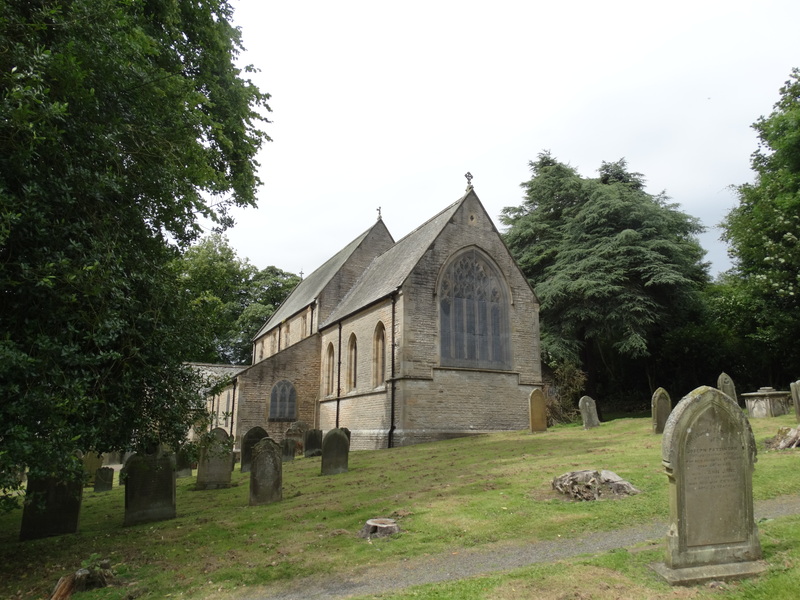 The new church was built by the Reverend John Milner MA, scholar of Queen’s College, Oxford. He also wrote that blockbuster “Old Catholic Versus The New Doctrine of The Real Objective Presence”, surprisingly not available from Amazon. The guidebook does not say why the church was rebuilt – there was quite a lot of industry in this part of the world, so I assume they needed more space. Mr Milner seems to have done a good job. 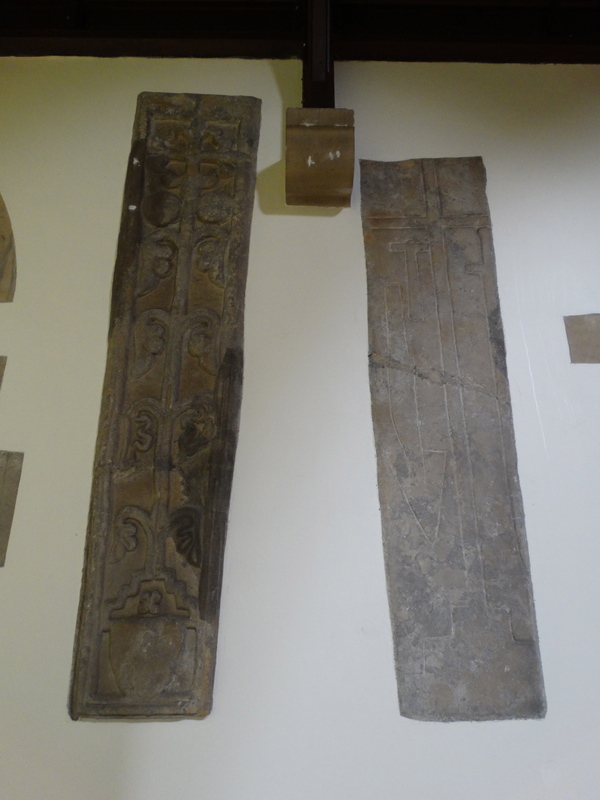 There are several mediaeval grave covers, zigzag mouldings and other fragments, some dating back to the Normans, displayed on the wall of the north aisle. 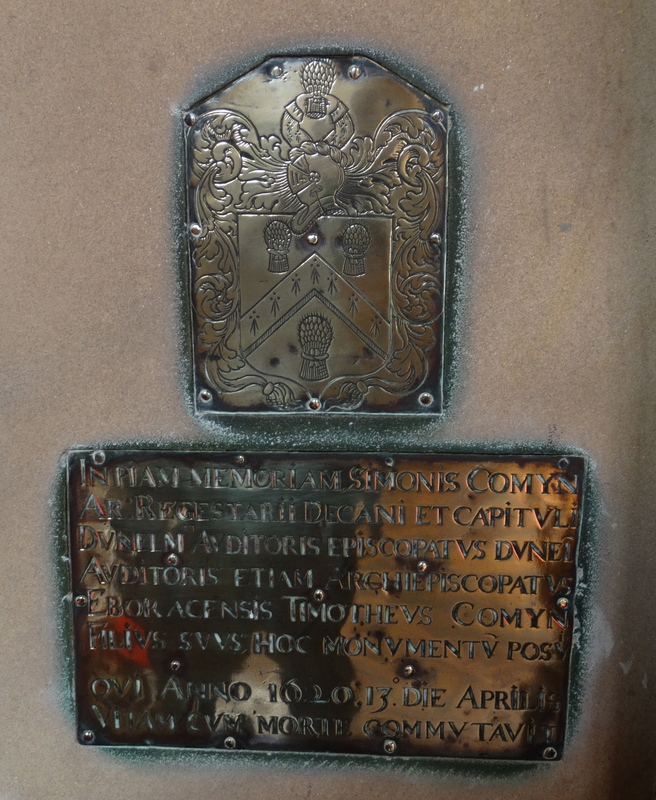 On the north wall of the Chancel is a memorial of brass commemorating Simon Comyn, registrar to the Dean and Chapter of Durham and auditor to the Bishop of Durham and the Archbishop of York who died in 1620. 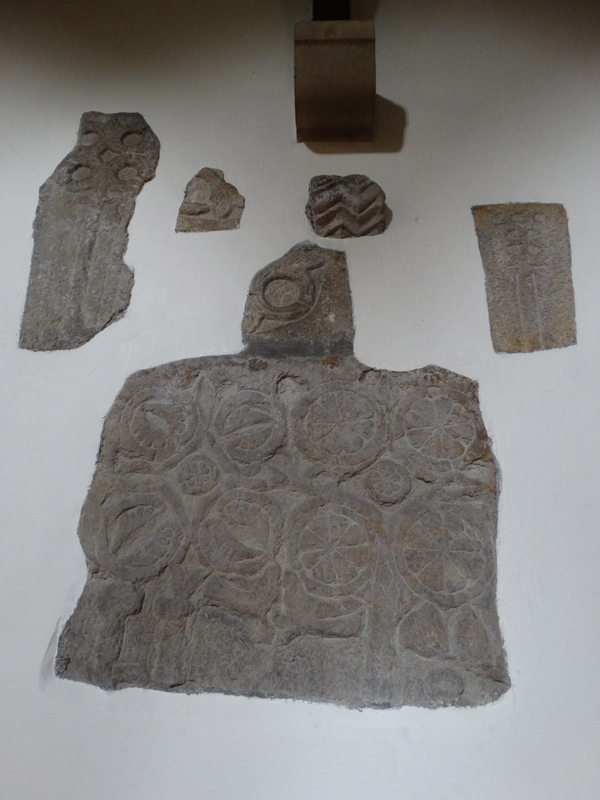 To quote the guide “It is not known why this memorial was placed in Middleton church.” It depresses me that, even in 1620, the bishop needed an auditor. Some nice stained glass. 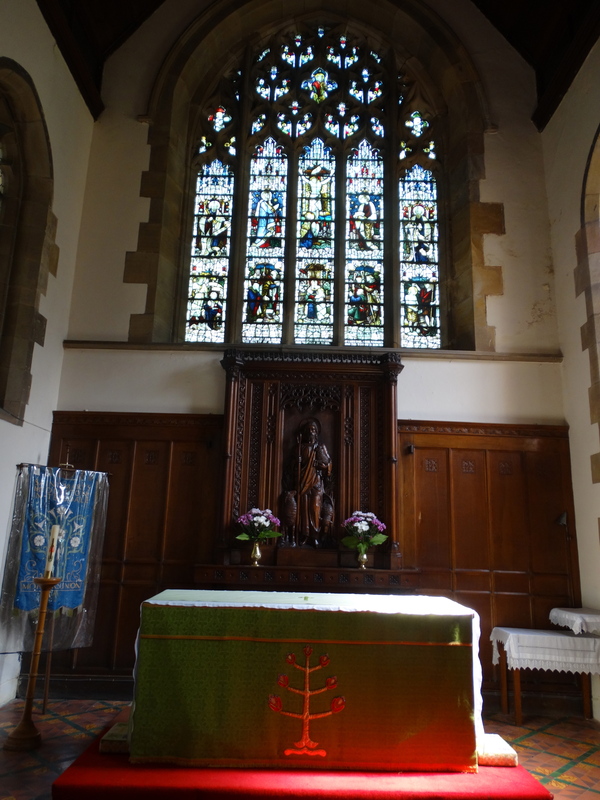 This window is dedicated to Canon Thompson, rector for 30 years 1951-81 – the guide doesn’t say who made it. Such long stays are now a thing of the past – this century has seen three Rectors already and is now in interregnum again. Does that say something about the stress of being a country parson in a world where most country people want their church, but don’t want to fund and support it? 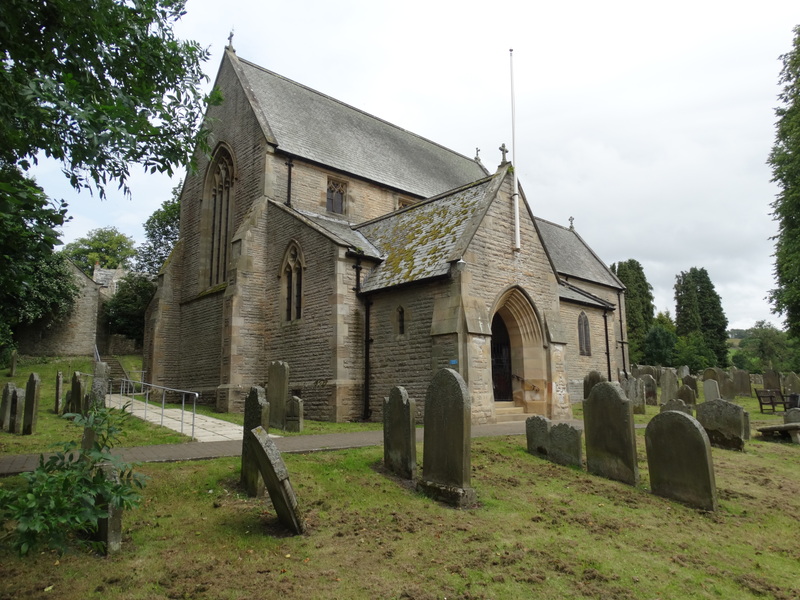 I remember how difficult I found it having villages that really wanted nothing to do with each other, that saw the Vicar as “theirs’” (and theirs’ alone), expected me to drive round all the churches every week doing a service for them (and they all wanted 10 am! ), and – if they didn’t like what you did – voted with their feet … . 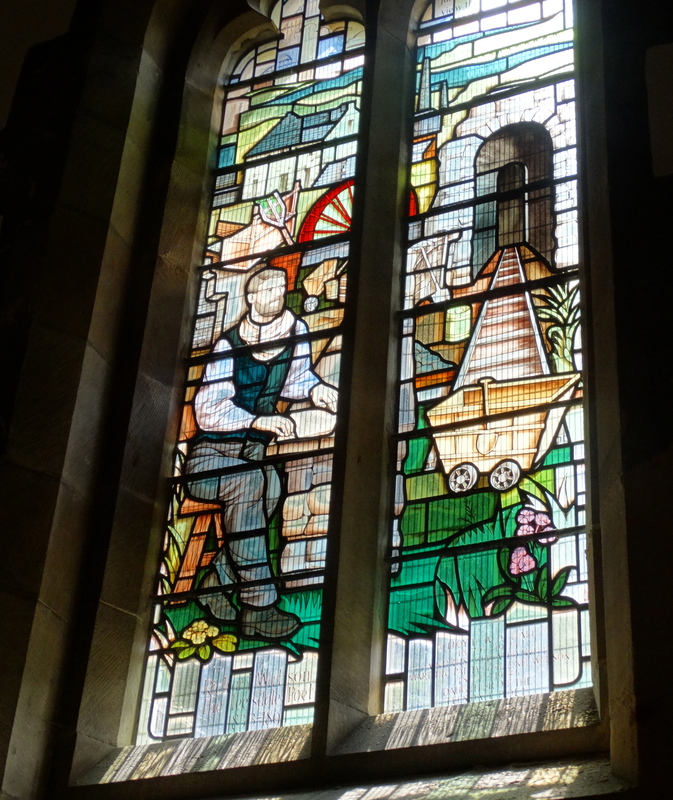 This window commemorates the local leadminer poet, Richard Watson, who is buried in the churchyard (though neither the guide or the “Richard Watson trail” leaflet tell me where in the churchyard!). He was born in Middleton in 1833, the son of a lead miner. He went to the London Lead Company’s school in the village from the age of 6, but had to leave at 10 since his father was seriously ill. He started above ground as a washer boy cleaning lead ore. His father died at the age of 47. Richard composed verses about his workmates, and when still a young man had his first poem published in the local paper. He was often called upon to compose rhymes for special occasions, and published a slim volume of poems in 1862. (I remember the hilarity when one of dad’s books was described as “this slim volume”). “It gave him little reward as he gave most of the books away”. 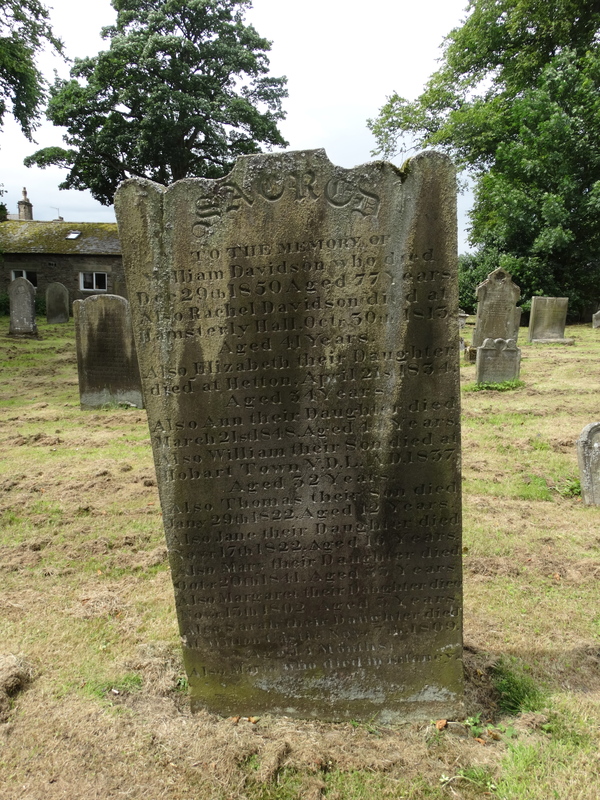 Most miners did spare time jobs such as knitting, woodwork or dry-stone walling (rare you see those three occupations in the same sentence), but Richard was more interested in reading and writing than hard, physical work. In latter years he became so impoverished that the Teesdale Mercury started an appeal fund to help him. Local people gave little, believing him to be mostly to blame for his own troubles. 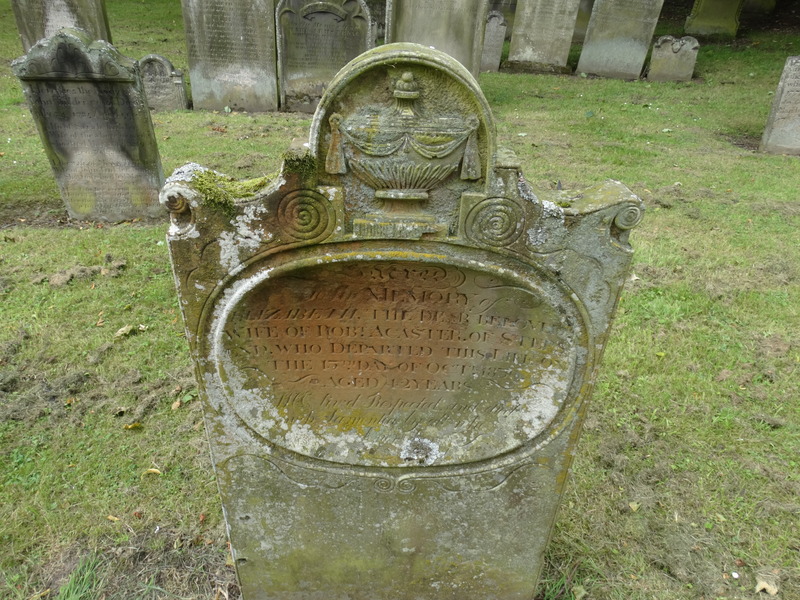 He died at the age of 58. Nowadays Richard’s seven mile commute to work is a leisure trail – then he would have walked on a Monday, and lived in a lodging shop for the week. “The mineshops were overcrowded (sleeping 3 or 4 to a bed) and filthy, stinking and verminous. Conditions were so bad that more men were killed by tuberculosis than died in mining accidents.” In the C21 none of us can really complain. 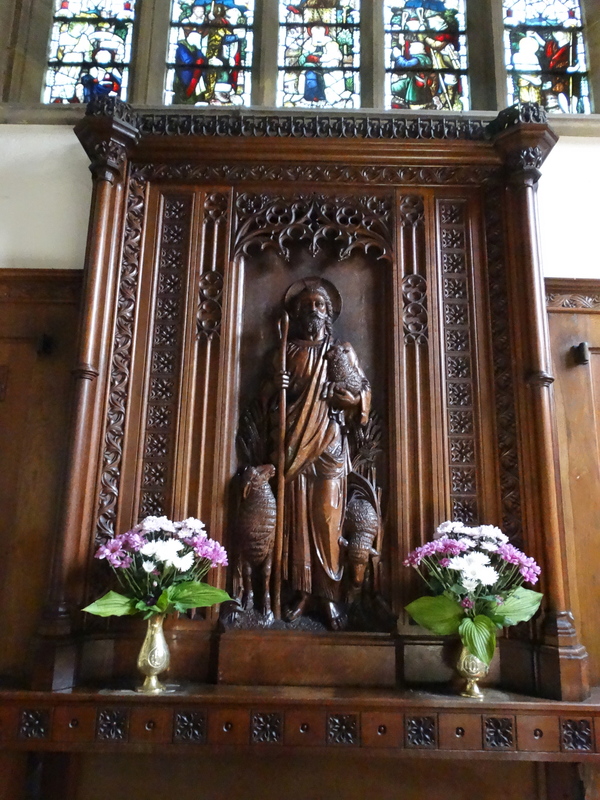 The oak reredos is in memory of Mr Milner, and the window is by Kempe. 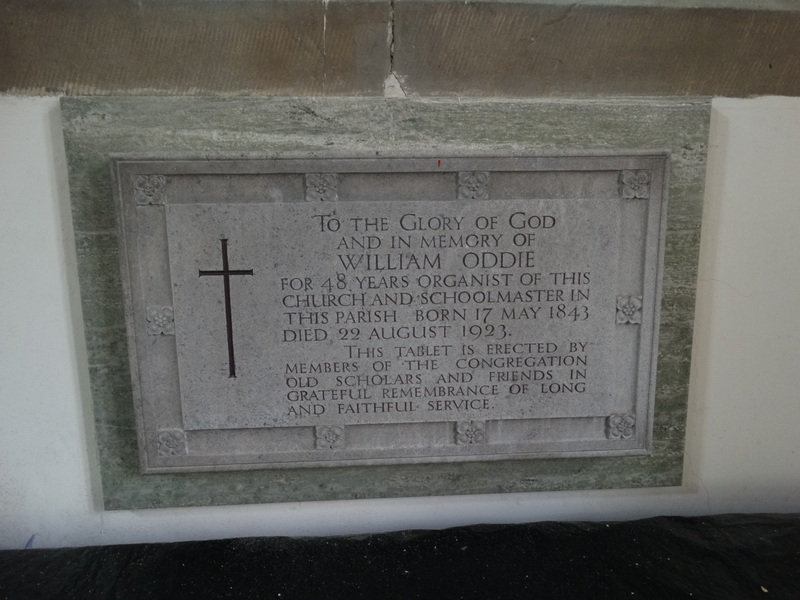 Nice memorial plaque for a schoolmaster and organist. Some nice windows in the south aisle – but I need one of my photographer friends to help me photograph in bright sunshine. 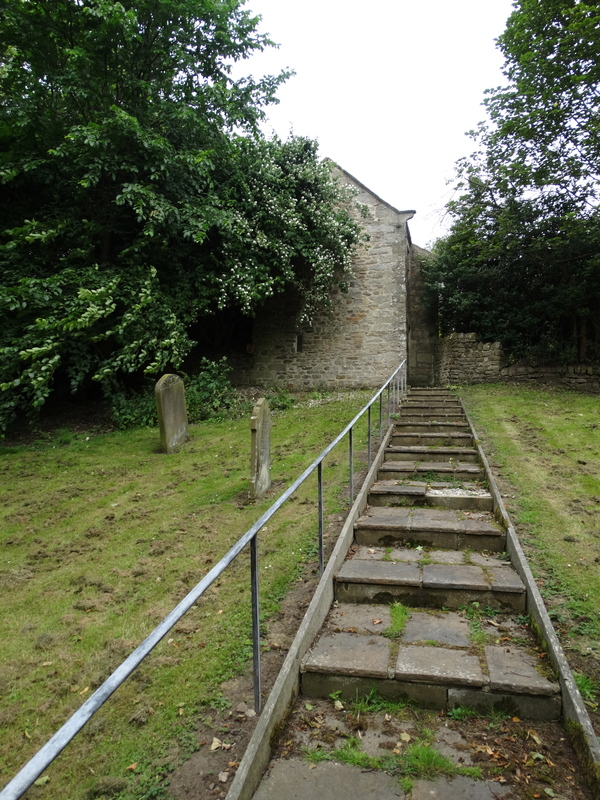 They have recently put a separate disabled access in, and there are steps to a separate building which is a Bell-house – bells redone for the Millennium. 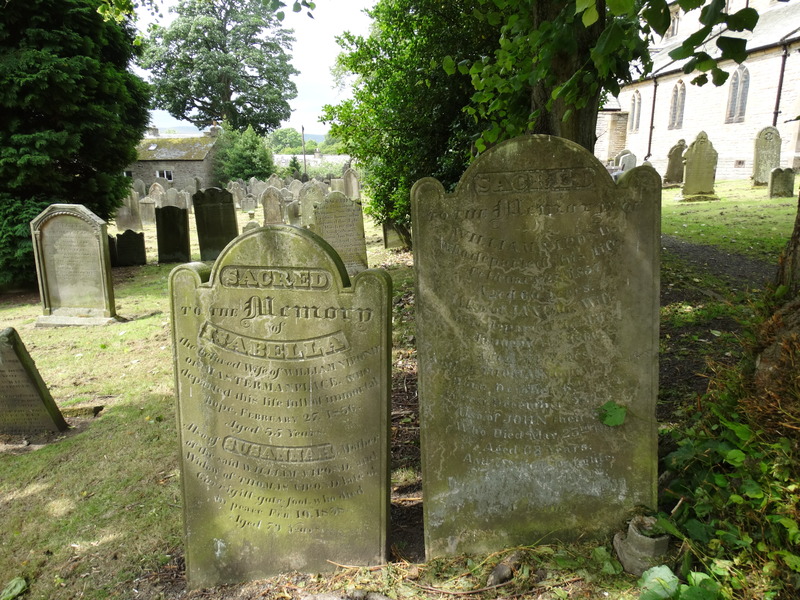 Fascinating selection of headstones too; the churchyard was in existence as long ago as 1313. I collected Julie and a huge pile of books, and we continued south over the Teesdale hills. This entry was posted in Durham, Outside Northumberland. Bookmark the permalink. 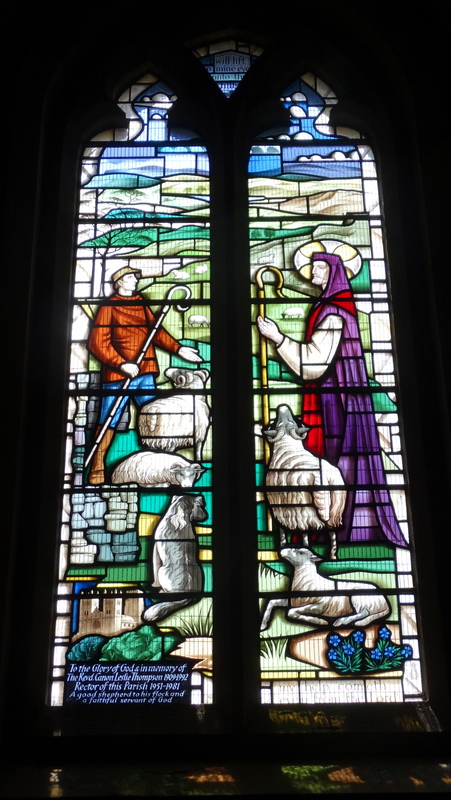 I loved your review and photos—- The Canon Thompson Window and the Richard Watson window were both designed and made by SEP WAUGH of York, I hope I have the spelling correct without me going to a lot of trouble to sort out paper work to check, but I will have correspondence and bills etc filed away. I was treasurer at the time and still am as it is very difficult to find a replacement. I am also a volunteer in the village bookshop.